Hot, humid and miserable has given way to breezy, cool and wonderful, at least for this morning anyway. Hey, I’ll take whatever comfortable weather I can get. Forecast temps of 104 degrees by the end of this week has me questioning, “What happened to our beautiful, cool mountain air?” The heat and humidity in the afternoon are likeFloridatemps. Can’t complain too much, we deal with it for about two and a half months while they deal with it for nine months. I will tell you this; the heat has me opening more crisp and refreshing wines than I can shake a corkscrew at. 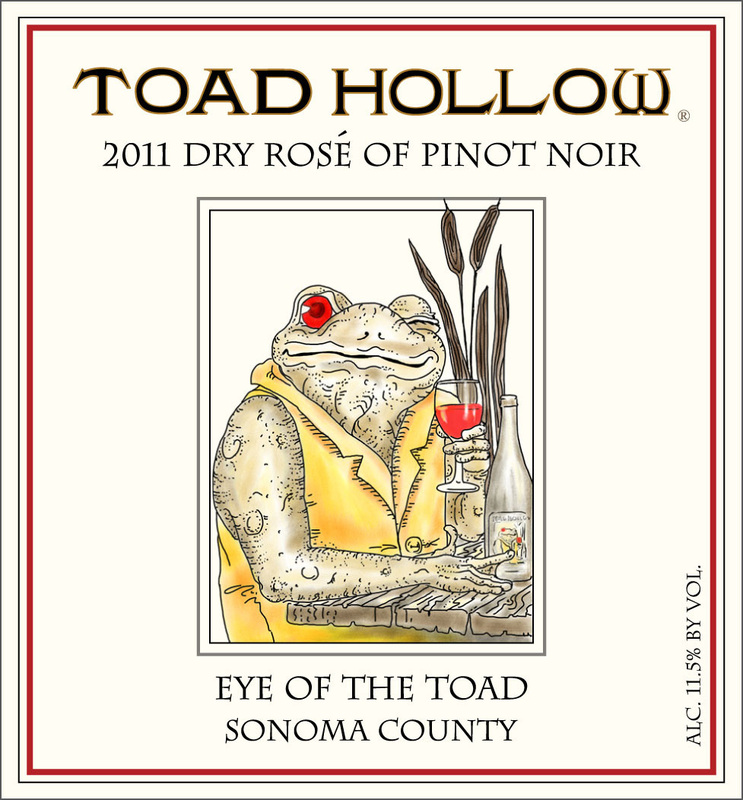 My latest, Toad Hollow’s 2011 Sonoma County Dry Rosé of Pinot Noir “Eye of the Toad” provided much needed relief from the heat but has the ability to warm my heart as well. Floral, strawberry and peach aromas. Flavors of acidic unripe white peach and strawberry with a long and pleasing finish. The Pinot Noir grapes for Eye of the Toad are sourced fromSonomaCountywhere cool evenings and mornings give way to warm sun filled days. The grapes are able to ripen slowly allowing for the full flavors to develop. I’ve written a lot about Toad Hollow (click here) and the passion and drive two friends shared. Dr. Toad aka Robert Todd Williams and The Dancing Badger aka Rodney Strong started the winery in 1993 after retiring. The premise was to make fine wines at affordable prices. It’s said Dr. Toad’s larger than life personality over shadowed his famous brother Robin Williams. Maybe that’s why Robin is so zany, just trying to get his share of the attention. Dr. Toad aka Robert Todd Williams passed away in 2007. According to his obit, his goal was to discount wine snobbery and make wine interesting. Hmm, I hope that’s what I accomplish with my posts to all of you each week too. The Dancing Badger aka Rodney Strong, was an early pioneer ofSonomaCounty’s wine industry. Strong was a successful dancer before retiring and taking on the title, winemaker. In 1959 he establishedSonomaCounty’s 13th bonded winery in 1959. Toad Hollow not only speaks to the kid in me with their wonderful illustrations and story but also speaks to me as a wine lover. I’ve said it before and I’ll say it again, wine is for sharing. Whether it’s a glass celebrating friendship, a wine to share over a meal with family or just a way to end your day; wine makes everything special. Speaking of special, I’m so excited about my upcoming trip to the Wine Blogger’s Conference inPortland,OR, I can hardly contain myself. I’ve booked my hotel for an extended stay atMcMenaminsCrystalHoteland will be staying at The Grand Lodge in Forest Grove, another McMenamins hotel. Not a plug for McMenamins, just love staying at off the wall, boutiques versus the corporate mainstream names and these both look like places I’ll have a really good time at. After those two, I will be heading to a corporate national chain generic hotel for the conference but at least there will be wine! As always, cheers to Toad and Badger! This entry was posted in Wines under $20 and tagged “Eye of the Toad”, Sonoma County, Summer Wines, Toad Hollow Dry Rosé of Pinot Noir, Wine Chicks Guide. Bookmark the permalink.